I first became aware of Susan’s work about 10 years ago when I saw this adorable Christmas keepsake book (pictured on the bottom in the picture to the left) in a quiet little bookstore in New York City. Even while living in the city, I always wanted to make sure I created a “home” in my little apartment, and the book just called out to me. I loved the writing, the font (or what I thought was the font, turns out it’s Susan’s hand-writing! ), the cover of the book and the immediate comfort the book gave me. So I bought it. 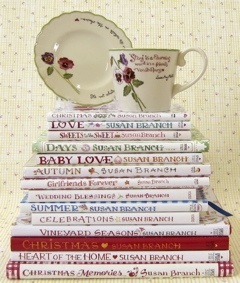 Then I checked out her website, www.susanbranch.com and I bought more books. When we started Better Way Moms, one of the things we wanted to emphasize was how important it is that women use their talents, and that we guide women through the process of creating their own small businesses. Susan came to mind immediately for me. I was so grateful (and even a little bit nervous) when she agreed to an interview for the site! She is delightful, full of inspiration and ideas for women and a true example of what’s possible when we believe in ourselves. Sarah: Wow, thank you. We think it’s pretty important. And it means a lot that you do too. Susan: Being a mom takes over your entire life. Because I was the oldest of eight, I got to raise kids right away. We had a baby every two years as I was growing up, so I really got a great opportunity to see exactly what it’s like. My parents were living in the 1950’s, so they had that whole “woman thing” “man thing.” He went to work and she stayed home. And my mother loved it. She was fine with it through the whole ordeal. She was just terrific. And thank god that she was like that because it was a true gift to us that she was such a great mom. But I thought, “Oh my God look at her, look at what she’s doing!” you know? We get new shoes, but she doesn’t get new shoes. And that’s just the way it was. Now there is just a whole new way of thinking about all this. There are only so many hours on the planet and you want to be able to have a life that includes everything. And the other piece of it that’s so ridiculous is that moms feel the pressure to “do it all” and that whole idea is just unbelievable. Sarah: I completely agree. And now we moms feel bad when we can’t do it all. I feel like that’s the biggest obstacle to moms being happy. Susan: Yes. There used to be an automatic down time. It was just built into everything. You know, now we come home from a trip, and what do we have? A mountain of e-mail, and mountains of phone calls. You used to not have any of that. You used to not have answering machines so there was just none of that. So you came home and your house was all quiet and you just put your stuff away and you got back to life. There is NO down time now. And it’s just not natural.